Ensuring robust and secure communications to Public Safety and Defense units can be challenging. Natural or manmade disasters may have damaged the telecommunication infrastructure (3G, 4G, GSM) or they may be saturated by citizen requests. Reserved frequencies and current temporary communication infrastructures offer little bandwidth or mobility. Green PI developed by Green Communications is an on demand Internet infrastructure that can be deployed in few minutes to provide secure and high-speed connectivity to mobile units. Green PI uses tiny routers (YOI) that can be quickly displayed in the environment or embedded onto robots and wearable equipment. Once deployed, YOI connects automatically with other Green PI devices using an advanced Device-to-Device technology to create an instant wireless network transferring video, call and data over multiple hops (up to 30!). Green PI also connect to other networks using YOI-4G/LTE device as gateway. 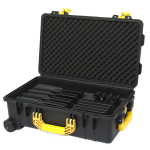 A group of YOI devices set on batteries is a portable and mobile network that can be deployed anywhere. YOI devices embedded onto drones and robots connect them with a moving & self-configured wireless network that transfers real time video or any data overs multiple hops. YOI embeds a local cloud. Hence, it is possible to host data, applications and services directly in the router instead of using distant server. The essential information and services are therefore available anytime, even when there is no Internet connection. Green Communications patented routing protocol ensures a robust connection in static as well as dynamic environment. 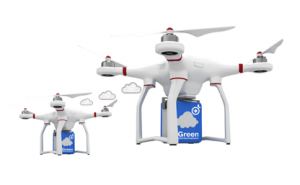 Green PI achieves real time video surveillance using squad of connected drones. Green PI uses wearable self-configured routers to make communication network deployment fast and easy. Green PI’s offers high-speed connection to transfer real time video in static as well as dynamic environment. Router’s power consumption is minimum so that one can operate a Participatory Internet in all types of environments (fixed, embedded, wearable).